It’s common knowledge that to acquire a skill, you have to climb a learning curve. “Curve” is a good description of the process, as the acquisition of skill – like in making accurate betting predictions – isn’t linear. Read on to find out how the Pareto Principle applies to betting and making more accurate predictions. The Pareto Principle (also known as the 80/20 rule) states that 80% of outcomes come from 20% of causes. For example, 80% of supermarket revenue may come from 20% of the product lines. The idea is attributed to Italian Vilfredo Pareto, who in 1906 observed that 80% of the land in Italy was owned by 20% of the population. The ubiquitous nature of 80/20 “Power Laws” (as they are known) even spreads to our personal lives. Try looking at retweets or likes on your Twitter profile (if you have one). You should notice that close to 80% of the interactions come from around 20% of your followers. Another example to use is your mobile phone – do 80% of your mobile SMS messages come from around 20% of your contacts? There is nothing intrinsically special about these relative proportions; it just happens that they describe the relationships across many dimensions. What is interesting to note, particularly for bettors, is how the Pareto Principle can be applied to accurate prediction. The issue for bettors is that to be better than the other 80% is an incredibly difficult task (as it is with any discipline). Additionally, there are multiple skills that need to be developed and refined and people often underestimate just how much of a challenge it is. Nate Silver has described this process in relation to poker in his book The Signal & the Noise – The Art of Science & Prediction, but it can equally applied to betting. The chart below simplifies the process of trying to become a more successful bettor as the relationship between accuracy of selections and the effort invested in making them. Effort in terms of betting can be quite broad – for some bettors just being able to get a bet down requires a great deal of effort. For the purposes of this article, we will define effort to include time, analysis and resource applied to making selections. The more popular a betting market is, the more information a bookmaker will have at their disposal. This then makes finding valuable betting opportunities a much more difficult task. Based on the Pareto Power Law suggests, as can be seen in the chart above, that with 20% effort you could match the accuracy of 80% of bettors. This is the obvious place to start with your betting, but how do you quantify your level of effort? Using soccer betting as an example, around 20% effort would probably include accessing widely available information like league tables and team news via mainstream media reports. The effort involved in using these tools is (comparatively) minimal, and therefore most bettors will use it – they will often be aware of it even if they aren’t researching it for the specific purpose of placing a bet. In order to progress and begin to make more accurate predictions, as the shape of the curve suggests, the marginal improvements in accuracy require proportionality higher effort with this power law intensifying as you seek to move closer to the Holy Grail of 100% accuracy. 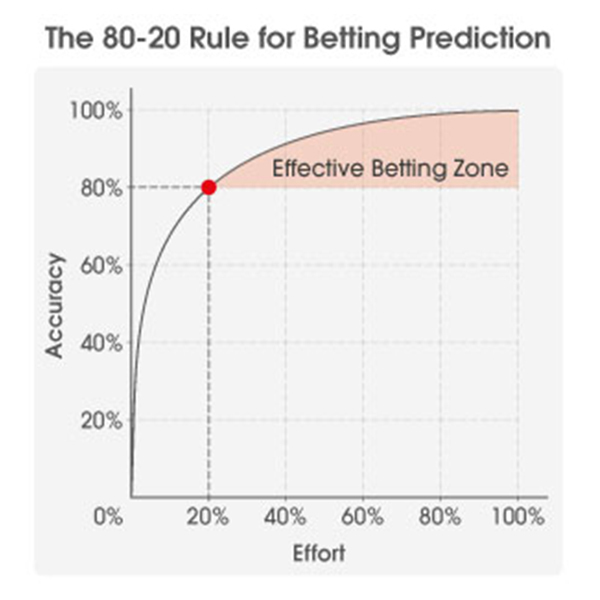 So what can you do to edge along the Pareto curve into the Effective Betting Zone (shaded in the image above) and pull ahead of the 80% of bettors making minimal effort to help improve your predictive powers and chances of making money from betting? One of the most obvious but regularly overlooked things to do would be to invest time to find out how betting actually works. This includes what a bookmaker’s business model looks like, calculating the margin they applyto odds and understanding what value means in relation to betting. Who you bet with has a major impact on how successful you can be as a bettor. Margins vary greatly from bookmaker to bookmaker, with Pinnacle at one extreme (lowest margin) and most other bookmakers spreading across the spectrum with increasing margins. It is amazing how many casual punters are ignorant of this fact. 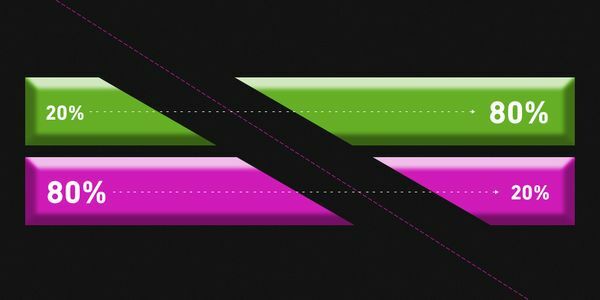 Understanding margins should be part of the process of educating yourself about the fundamental principles of betting – along with understanding expected value, different bet types and the importance of market movement. In order to progress and begin to make more accurate predictions, the marginal improvements in accuracy require proportionality higher effort. Following on from this, you can begin to look into assessing your level of skill, researching the psychological side of betting and learning more about behavioural biases and then move on to more advanced concepts, which as the curve demonstrates, require more effort. If you already have a background in mathematics or programming (or are willing to dedicate the time required to educate yourself), you can also leverage this to move you ahead as you will soon require these skills as part of your journey along the curve. Some bettors may find that trying to develop their knowledge to a higher level intimidating or too difficult and decide that it does not warrant the effort. It could also be that seeing negative results and makes them think that the increased effort isn’t worth it. However, it is important to ensure the sample size of data you are looking at when analysing results is big enough to remove the instances of both good and bad luck. The alternative to putting in the effort is to try and cheat the curve by relying on the efforts of others (tipsters). However, this is a false economy as you need advanced skill and knowledge to understand whether a tipster is worth following in the first place and be able to test their credibility. This is obviously effort that could be put into your own betting activity. Is effort magnified in specialist areas? All of the above deals with the generalities of betting without specifying a sport and this is obviously an important point to consider as not all sports are the same. Attempting to be among the most accurate bettors for popular leagues like the Premier League, NFL or NBA will require far greater effort compared to other sports as you will be competing with the best minds and sophisticated technology. The more popular a betting market is, the more information a bookmaker will have at their disposal and the more refined their odds will become – this then makes finding valuable betting opportunities a much more difficult task. So, does this mean it’s easier to find value in betting markets for less popular sports? Some bettors may choose to specialise in a lesser known sports or alternative betting markets in order to improve their chances of making money from betting. Although your own knowledge or information may be limited, so too would the bookmaker’s and thus it would be more of a level playing field with potential odds deficiencies that can be exploited. ← What is the Fibonacci betting system?